This course is designed to help you understand how to manage the impressions you create on others. It enables you to develop your outward and inner self by learning the acceptable standards of outward appearance and by developing your self-esteem and self-confidence. The course also helps you to learn how to be assertive when required and give tips to boost your self-confidence to create lasting impressions. This course strengthens your foundation on how to create good impressions in just 5 exciting levels. You are made aware of the impressions formed in one’s day to day lives. The need and importance of impression management is discussed. This level also focuses on common mistakes made while forming first impressions and the factors that influence them. Creating positive impressions involves overall development of one’s self. Understand the various standards of professional dressing and appearance to create lasting impressions. Learn how to improve your inner self by using tools and techniques to have a better self-perception. Understand the concept of online identity and the increased use of social media in impression formation. This level focuses on two major aspects of developing the inner self: Self-esteem and assertiveness. It gives tips to improve one’s self esteem and overcome the challenges of being assertive. 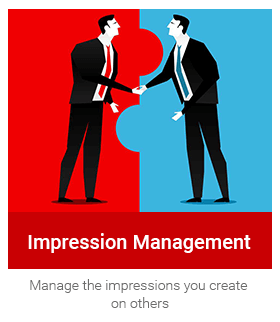 As a compilation of what you have learnt so far, this level summarizes impression management as a skill and gives points on Do’s and Don'ts of Impression Management. The course ends with an acronym to help you easily retain your learning.